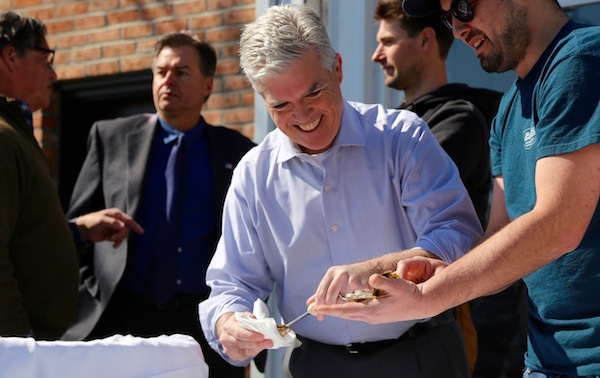 Pictured Above: Suffolk County Executive Steve Bellone tries his hand at shucking oysters at the March 11 press conference at Catch Oyster Bar in Patchogue. There are few scenes more evocative of the East End than the presence of local oyster shuckers at events celebrating our local food culture. But few fairgoers know that in order to get to those events, oyster farmers first have to cut through mountains of red tape. Under current regulations, Long Islander shellfish farmer are required to apply for a Vendors Temporary Food Service Permit with the Suffolk County Department of Health Services in order to market and sell their products to consumers. These permits cost $95 and are valid for a single event at a fixed location, with a 14 day limit. If approved by the legislature, Mr. Bellone’s new legislation would create a Shellfish Annual Temporary Event Permit for vendors of shellfish grown or harvested in Long Island waters. The permit would be valid for one year at temporary events approved by the Department of Health Services. There will be no fee for the Shellfish Annual Temporary Event Permit for the first two years. Mr. Bellone announced the program at a March 11 press conference at Catch Oyster Bar in Patchogue. Oyster populations help waterways by eating algae, filtering out particulates and excess nutrients and creating habitat for other organisms to thrive. Each oyster can filter up to 50 gallons of water each day. The Long Island Oyster Growers Association estimates that Long Island oysters filter approximately 900 million gallons of water every day. Both Suffolk County and New York State have pledged in the past year to do more to encourage oyster growers on Long Island. Last May, Governor Andrew Cuomo deployed the first installation of recycled materials from the former Tappan Zee Bridge in an effort to expand New York’s network of artificial reefs.The county is in charge of an Aquaculture Lease Program in publicly-owned underwater lands in Peconic Bay and Gardiners Bay. The lease program began in 2010, and is currently undergoing a 10 year review, which includes reexamining the number of leases that can be issued annually. According the Suffolk County Department of Economic Development and Planning, for the five-year period 2012-2017, the total economic output of the Lease Program is estimated to be $13 million. The program has issued leases to 55 businesses in Peconic and Gardiner’s bays.